This fun-loving, crowd-pleasing musical features 27 classic songs, including "Crazy," "Walkin' After Midnight," "I Fall to Pieces," "Sweet Dreams," "Back In Baby's Arms" and more. Always Patsy Cline is more than a tribute to the legendary country singer who died tragically at age 30 in a plane crash in 1963. The show is based on a true story about Cline's friendship with a fan from Houston named Louise Seger. Making a special trip to a honky-tonk bar in Houston, Texas, Louise met her idol, Patsy Cline. Here was a woman that gave her soul a voice. Over a pot of strong coffee, a friendship began that would last until Patsy's untimely death. Through letters and visits, the two share the homespun stories of laughter and heartache that brought together a housewife and a legendary country singer. 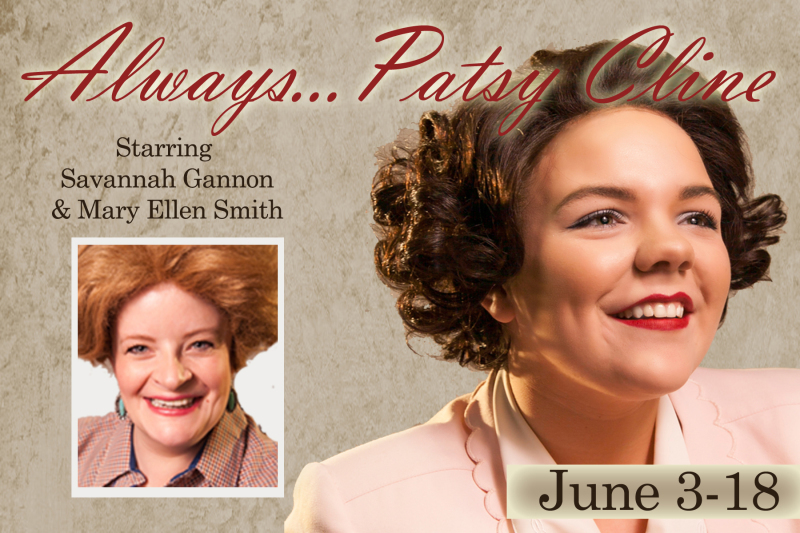 Directed by Matt Smith, this production features Savannah Gannon as Patsy Cline and Mary Ellen Smith as Louise Seger. Tickets are $15 with discounts available for students and seniors and can be purchased by calling (615) 563-2787 Tuesday through Saturday 10AM-4PM or online at artscenterofcc.com and (subject to availability) at the door one hour prior to show time. Always Patsy Cline is rated PG.